A) A drably illustrated children’s story about a brave Pilgrim girl who keeps her chin up and her white cap starched. B) The recently discovered memoir of a steely Puritan whose 17th-century life makes an unfortunate slog of a read. C) A quiet, sublimely merciful contemporary novel about love, yearning, and resilience in a family damaged beyond words. Ding ding ding! Yes, the correct answer is C, but didn’t A and B sound more like it? You’re going to have to get past the ill-advised title of this ethereal novel, though, and simply start reading it. By about the third page, you will be too absorbed to mind. And Lucy Barton, the main character and narrator, is lovely. Really she is, though when we first glimpse her — through the haze of her own memory, gazing back on the mid-1980s — she isn’t well. Attempting to recover from we’re not sure what, she lies feverish in a Manhattan hospital bed. Her husband, William, and their two young daughters seldom visit, and she’s lonely as the weeks stretch on. So she’s surprised and comforted when her mother appears, sitting at the foot of her bed, gently calling her by a long-ago nickname. “Hi, Wizzle,” the older woman says, as if years hadn’t passed since they’d seen each other last, as if there’d been only affection and protection, no abuse, in their home. Strout is known for fiction rooted in New England, most notably her Pulitzer Prize-winning novel, “Olive Kitteridge,” but this is a New York story, and Lucy is a writer. She grew up poor in small-town Illinois, frightened of her volatile father, shunned by the other children at school, but nurtured in subtle, important ways by the occasional kind adult. She became studious. She flourished. Unlike her older siblings, she went off to college. She escaped to the big city and a comfortable life. This hadn’t gone over well with her family. Neither had her choice of spouse, the son of a German immigrant. To Lucy’s father, William looked unsettlingly like the people he’d fought against in World War II. 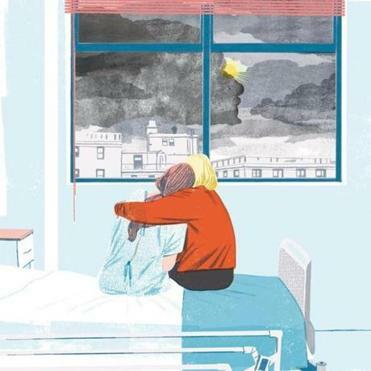 But when her mother arrives in her hospital room, as if answering Lucy’s primal longing to be soothed and taken care of, all of that is unspoken. For days, they chat instead of their hometown in farm country, where Lucy left her parents long ago. Lucy’s mother, who sits and sleeps in a nearby chair, catches her up on old gossip, mainly about marriages that have been dented and sometimes destroyed. And so her presence assuages her child’s isolation and fear. “My Name Is Lucy Barton” is partly about imperfect love — by parents, by spouses, by children — and about the salving goodness that so often and incongruously coexists with a person’s toxic badness. Beyond recalling a couple of lacerating scenes of neglect and emotional brutality, Lucy can barely bring herself to tell us what so terrified her about her father’s behavior. But she does remember a tender gesture (“the feel of his warm hand spread against the back of my head” as he carried her young self) and a moment when he was generous in a way that any father would want to be with a child. When we realize that some of his torment, anyway, came from living with an act of barbarism he committed in the war, the pain makes him seem human, even though his response to his own trauma traumatized his family. These psychic wounds of her childhood are part of Lucy, but they do not define her. We see this as we watch her find her place in the world, learn how to be ruthless for her art, and come to understand that while humiliation is unacceptable, humility is essential. Great moral acuity underlies the gentle spirit of this minutely sensitive book, which prefers complexity to condemnation. So you will find no unadulterated villains here, only deeply fallible human beings — each of them with a shot at some kind of redemption, and maybe even joy. Random House, 193 pp., $26.